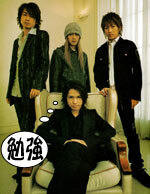 This song was featured as the opening theme song for the anime "GTO". Let's gun it, and commit double suicide; now reach out your hand! The finale is going to be great! Yeah! Once you've changed into your favorite clothes, we'll take off! I'll see you in the next world, yeah! Nintendo DS - Utada Hikaru "Touch"